SS 316L Round Bar, UNS S31600 Threaded Bars Dealer, SS 316 Round Bar, Stainless Steel 316 Bars, UNS S31603 Round Bars, ASTM A276 SS 316 Bars, DIN 1.4401 / 1.4436 Rods Exporter, SS 316L Bars Suppliers in Mumbai, India. 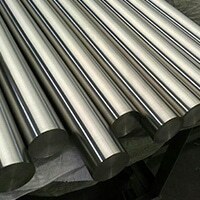 Stainless Steel 316/316L Round Bars are molybdenum bearing austenitic stainless steels bars. These bars have shown excellent resistance to corrosion in a wide range of media. The presence of higher nickel and molybdenum possesses stress rupture, creep and tensile strength at elevated temperatures. In addition to the bars provides superior resistance to the crevice and pitting corrosion in warm chloride atmospheres. Moreover, it also shows good resistance to stress corrosion cracking above 60 degrees C.
Stainless Steel 316L Round Bar, SS 316-316L Black Bar, SUS 316 Square Bar, SS 316 Hex Bars Manufacturer, Austenitic Stainless Steel 316 Bar, SS 316L Bright Bar, SS 316 Flat Bar, Stainless Steel 316L Forged Rod, WNR. 1.4404 / 1.4435 Round Bars Distributors in India. The presence of low carbon in grade 316 L immune the round bars from sensitization and are broadly utilized in heavy measure welded works. Therefore the austenitic structure of these round bars even down to cryogenic temperature and also offers great toughness. The welding of these bars is performed by both resistance and fusion process. Fabrication details In order to meet up the requirements and desires of the patrons, the manufacturer offers the bars in diverse shapes, standards, dimensions, size, and length according to them. The firms are committed toward the quality of the product so to achieve quality worthy product they procure top-notch quality raw material. Even more, they worked with qualified professionals and dedicated personnel that enables to carter national and international standard product. On the other hand, they admire the latest and advance tools to obtain a smooth finish product. Testing of product To attain quality assurance product many essential testing programs are conducted on various parameters. Such tests are like IGC test, chemical analysis, mechanical test, flaring test and pitting resistance. Importance of packaging To protect the product from any severe damage and scratches throughout transit the firm uses standard packaging material for packing. Thus the products are packed in wooden cases, carton boxes and wooden pallets. SS 316 8.0 g/cm3 1400 °C (2550 °F) 515 Min 205 Min. 35 % Min 217 Max. SS 316L 8.0 g/cm3 1400 °C (2550 °F) 485 Min 170 Min. 40% Min 217 Max.